Impressed by all the ways the NZ Herald is allowing people to get the latest news (Twitter, RSS Updates, Widgets, YouTube, Digital Replica, Email Updates, RSS Feeds, Mobile, Paper Delivery), I decided to look into what some traditionally Old Media newspapers are doing with New Media in New Zealand; The New Zealand Herald, Otago Daily Times, The Dominion Post, Waikato Times, and the other "Newspaper" sites hosted on the Stuff.co.nz platform. At the base of each page, the NZ Herald promotes all of the ways they allow people to get the latest news. Each post enables people to distribute the content further via Email or IM. Blogs are also a component of the site where people can comment on a variety of topics. There are however no general commentary features for non-Blog news stories. 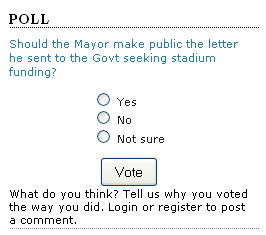 The Otago Daily Times has an RSS Feed and also sports an Online Poll. 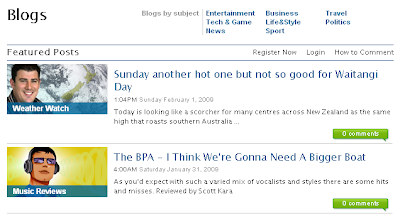 The stuff.co.nz platform hosts many of New Zealand's newspapers and consequently have a very similar look & feel and make use of its common capabilities. Prominent on each page is the ability to set up a variety of alerts, including RSS feeds. In terms of distributing the content further "Email a Friend" links are easily found associated with all stories. 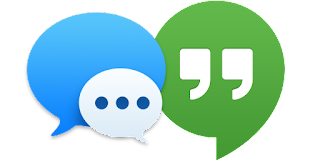 Although these sites have the concept of a Blog, there is no ability to post comments, other than a more generic "Have your say" feature that is not associated back to the blog post and is akin to sending in a new news story. It is great to see New Media being embraced by so many newspapers in New Zealand. Admittedly many of them are hosted by stuff.co.nz and whilst this platform is not as rich in its adoption of New Media as The New Zealand Herald, there is the advantage that if this platform gets updated that many readers of the various different newspapers will benefit. The Otago Daily Times capability of allowing people to comment on any story and to easily submit stories to a variety of Online Services is something I would like to see on more news sites.